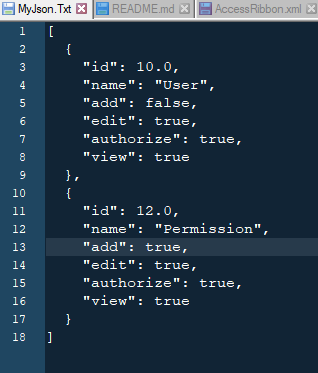 Recently stumbled upon a task where JSON string was passed between two systems. While giving a solution for that, I also adapted JSON Import and Export for Ms Access. acStructureOnly => Just creates the table definition. If you are not familiar with my previous vba_tools post, please do have a look at the post and download the sample Access project where you will find many interesting code including this magic one. When we say export, we usually mean to export the content out of the host application. By that, either saving locally or sending/pushing to a different application. ExportToJSon can be used to export json into a file as well as it returns the json string as result. So it can be used to “convert table content to json” too. In addition, unlike Access traditional export methods, ExportToJson takes an SQL command which can be exported to a file. above code executes the SQL SELECT command and saves the result set as JSON formatted string. In this method, we have passed a table name/query name to the export function and set isRawSql = false. The export function will then generate SQL statement similar to “SELECT * FROM givenTableName/QueryName;” and perform the JSON Export. If the SaveAs is empty, no file will be exported but the conversion will still happen and converted string will be returned as result. hello, I would like to use your function to save the content of the Clipboard to a pic. I thought it would be necessary to link VBA_TOOLS.DLL in References. But that gives an error: not able to make the reference. So I wonder what to do to make it work? or raise a new issue there for your exact problem and i might be able to help you there.